“Here in Barcelona, we lack courage,” Miró wrote in late 1917 to his studio-mate Enric Ricart. “We, the younger generation, could get together and exhibit every year, all together under the name of the “Chrome Yellow Salon,” for example, and pronounce virile manifestos. . . . We have to be men of action.” During the next few months Miró, Ricart, and several associates did band together—not as the Chrome Yellow group, but as the “Courbets,” in honor of the nineteenth-century French Realist famous for inciting controversy at official exhibitions. Their devotion to modern French painting notwithstanding, the Courbets were committed both to Catalan tradition and to radical pictorial innovation. 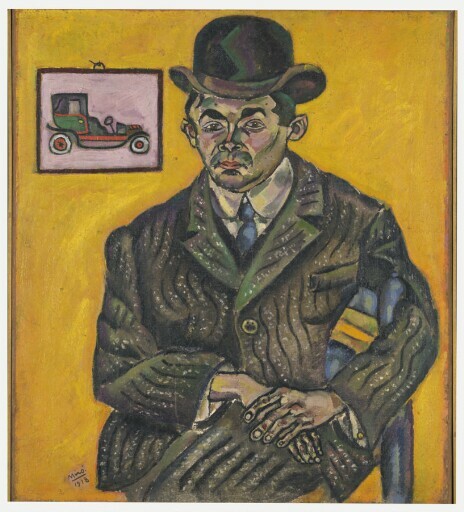 Among the three works that Miró presented when the Courbets first showed together in 1918, this portrait of his art-school friend Heriberto Casany, with his spindly fingers and the undulating folds in his tweed suit jacket, resembles saints depicted in medieval Catalan frescoes with gold backgrounds. Casany’s attribute is quintessentially modern: a framed cartoonlike image of an automobile, which apparently refers to his father’s cab-rental business. Treated in Fauvist fashion, with disconcerting green, yellow, and violet shadows, Casany’s schematized features appear animated with a life force. As Miró explained later, “Even in my portraits, where I tried to capture the immobility of presence . . . I tried to get the vibration of the creative spirit into my work.” Miró’s treatment of his friend’s fine haberdashery, his rendering of the stripes and texture with undulating lines and white specks, makes the inanimate tweed as vividly alive as the sitter. Just such attention to minute details would become the basis for the highly poetic, pulsating pictorial language Miró developed in the following decades to evoke tilled fields, starry nights, and nature in all its abundance. René Gaffé [1887-1968], Brussels, 1929.